It’s 2016. A healthy & prosperous New Year to everyone. We’re all rising to the occasion. 2016 is the 100th anniversary of the Easter Rising. The 1916 Easter Rising set off a series of events – the War of Independence, the Irish Civil War and the Partition of Ireland – leading to the establishment of the Irish Free State in 1922. As a Graphic Designer I meet a lot of business owners. I work with Start Ups. I’ve been asked what are the most important things I can do for my business. I’ll share three. You have an idea. You can improve the world. You have the skills. Now you must promote your enterprise. Know your Business. Promote your Business. Have Business Cards. Promote your Business. 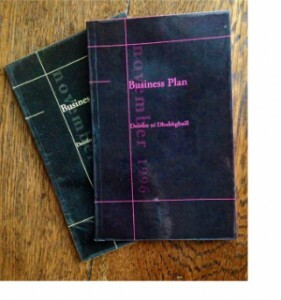 Create your Business plan. Promote your Business. Your Business/ Enterprise Plan should be revisited, reviewed & updated every two – three years. This will keep you on track with your vision. It will allow you see what has been working. How you can take advantage of recent developments. Ensure you reach your long term goal. • Consider a website. A website site can vary from a single page. An online flyer with your business description, contact details & links to your social media, Facebook, twitter, Linked In etc.. A small website with home, about, product description, where to find us, contacts pages to an extensive multi page brochure. Your website may contain blog, a set of articles you write or have written for you based on your product service or business interests. Regular updates will keep you in the sights of the search engines. Your site could be an online e-commerce retail outlet. The possibilities are endless.